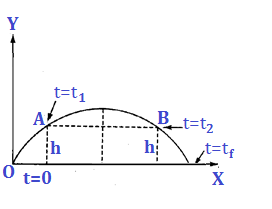 Projectile motion is a form of motion in which an object or particle (called a projectile) is thrown near the earth’s surface, and it moves along a curved path under the action of gravity only. 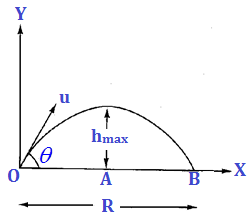 Motion along Horizontal direction: A body projected from the ground with a velocity u at an angel with the horizontal. R = u2 sin (2θ)/g. 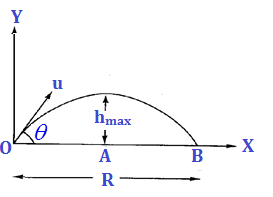 ⇒ The horizontal range is the same for angles θ and (90⁰ – θ). ⇒ At the point of projection, KE = ½ mu2, PE = 0. Total energy E = ½ mu2. c) Average velocity during time interval (t2 – t1) is vav = ucosθ (·.· during this interval, the vertical displacement is zero).